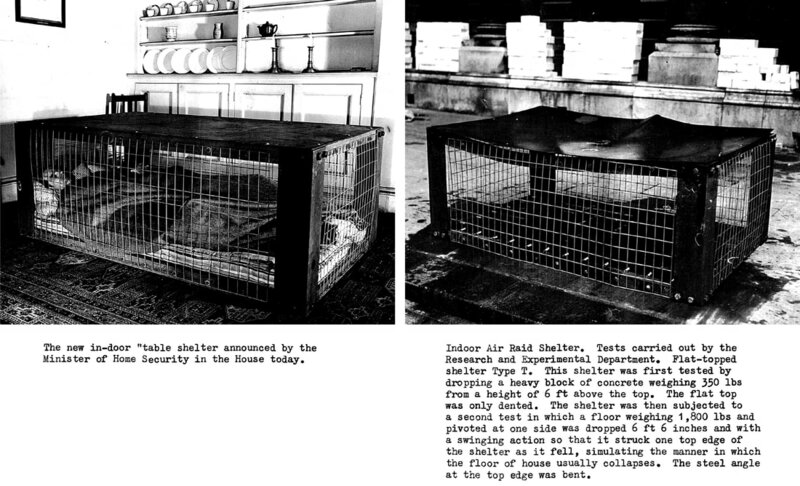 Before and after images of an experiment carried out on the Morrison Shelter by the Ministry of Home Security in UK, 1943. Copyright and courtesy of the Imperial War Museum. These images were used in the promotional material ‘From Above and Below’. This multi-media event brought together a series of investigations into the shifting parameters of contemporary warfare. With the intention to not only convey the position or physical viewpoint — from above — which the state apparatus utilises as part of modern day conflict, exemplified by the use of armed drones and aerial bombing. In particular this event focused on the position — from below — mobilising the domestic arena as a platform, and as a material and human register of this perceived external threat. By exploring this condition the presented works observe a violent interpenetration of private and public spheres, a condition that is intensified by the multi-scalar effects of war. The proposition of the event is thus to better understand the effect of being positioned ‘From Above and Below’ and to analyse the transformations this doubled condition might create, as it impacts directly upon the human subject.